In a fun night, Carlton demolished Essendon by 74 points at the MCG. Betts kicked 8. Goalkickers: Betts 8, Walker 4, Armfield 3, Gibbs 2, Kreuzer 2, Murphy 2, Garlett, Judd, Yarran 1. Saturday night lights at the MCG for another blockbuster against old foe Essendon. The Blues in their biggest slump of the season, losing three of their previous four, with the Bombers emerging from theirs after three wins on the trot (including the prized scalp of Geelong). Despite the relative discrepancy in form the Blues still went in as favourites and justifiably so as it panned out. The Blues were still looking a little light on in the key posts, particularly so when it came to light that Paul Bower had allegedly injured a calf while lapping the Princes Park surrounds post game in round 17. Young big man Matthew Watson was overlooked after a shocker in his third AFL game, whilst Aaron Joseph marked his 50th game with a loss and a hamstring injury. Into the side came Dennis Armfield, Marcus Davies (his first for the season) and Zach Tuohy. Carlton got the fastest of starts when Eddie Betts opened his account early in proceedings with a beautiful stretching mark on the lead and the truest of kicks from the ensuing shot at goal. Not to be outdone, Jeff Garlett used his lightning speed to get on the end of beautifully weighted ball from Kade Simpson which put him into space for the Blues second. After the shock of Carlton’s fast start Essendon steadied and claimed the next two to put the game back in the balance. It was a free-flowing game for the most part early as the sides went end to end and goals came seemingly with ease. Next it was Andrew Walker getting in on the act and when Betts kicked his second shortly after, courtesy of some Chris Judd handball magic close to goal, the Blues were back out to a two goal lead. Essendon retaliated with the next two before the Blues grabbed the final goal of the term late in play when Betts calmly slotted his third for the quarter to give the Blues a seven point edge. Things continued where they left off in the second quarter as the game ebbed and flowed, first Carlton sneaking ahead then Essendon returning fire, and vice-versa. The goals still came freely and to my eye it appeared the Blues had the better of the running without being able to gain any true advantage or ascendency on the scoreboard. Matthew Kreuzer was offering a target up front and kicked his first after a strong mark that tested the reconstructed knee and left a few of us hyper-ventilating briefly. Bryce Gibbs and Dennis Armfield both hit the scoreboard before Betts edged his man under the ball to take the simplest of chest marks and run into the open goal for his fourth. All the while Essendon had been chipping away, keeping pace with the Blues and as the siren sounded for half time the seven point quarter time lead remained intact. It was a premiership quarter to remember. Eighties style. Think free-flowing, highlights galore, plenty of goals, the opposition goalless, you get the picture. It was the quarter that put the game beyond any doubt and better still it was Essendon. The party started like so many do, the guests a little quiet to begin with, easing into it as Judd hit up Kreuzer for his second. But once it got going everyone really warmed up. A burst of five goals in nine minutes mid-term took the game away from the Bombers. Yarran, Judd and Murphy, Betts and Walker again all kicked goals to stretch the lead out to 46 points. Betts’ fifth warrants further mention. It was a piece of pure magic, working the claustrophobic confines of the boundary and goal lines near to perfection. Essendon defenders appearing to stand still and too embarrassed to guess which way to turn next, Betts eventually hooked the ball through on his right from close range entering his nomination for goal of the year. His sixth was something more in keeping with his usual style, a nicely finished set shot, but gave him a personal best, six for the game. Armfield’s second came after burning away from the Essendon defence and ended Carlton’s eight goal run in the third quarter before a rushed behind in the 29th minute finally gave the Bombers their opening (and only) score for the term. Blues by 58 points at the final change. With all the sting gone from the game and the result beyond doubt you’d think they’d be just going through the motions. It started out that way as Essendon tried to add some respectability to the scoreboard with four of the first five goals in the last. But then the Blue machine fired again with six goals in the latter part of the term to completely dominate the final quarter. Without question the highlight of the quarter, the game, the round, perhaps the season came when Andrew Walker delivered on a threat he’s been making since his debut game many years ago. Walker’s athleticism is beyond question and time and again he uses it to throw himself into packs in outlandish attempts to take “that” mark. Well this Saturday night, he took “that” mark. 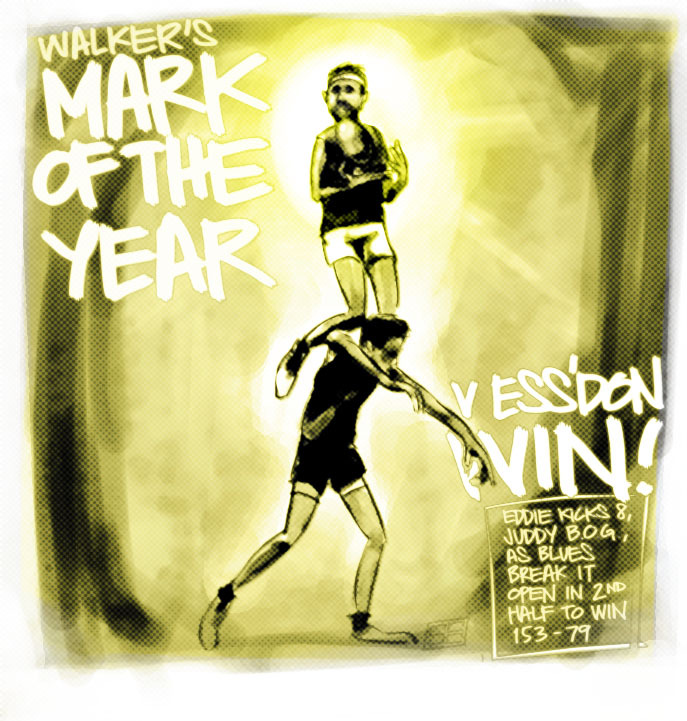 With the perfect sit on giant Bomber debutant Jake Carlisle, Walker took three steps, launched, placed his knees perfectly atop Carlisle’s shoulders, got the second ride, sprung skyward and took the most spectacular of chest marks. It was a sight to behold and footy lovers everywhere rose to their feet, mouths gaping and applauded. In amongst all that excitement Eddie Betts managed a career high eight goals, the Blues executed a superb 74 point victory and the Carlton faithful took home some very special memories. In a fascinating historical post-script to this game, Eddie Betts also passed Syd Jackson's 136 games to become Carlton's Leading Indigenous Player (by games played). Eddie was 24 years and 246 days old when he set the new record. In comparison, Syd Jackson played his very first game at 24 years, 278 days! In Syd's last game he was aged 32 years, 79 days. Games Records for Indigenous Players: In his 137th match, Eddie Betts overtook Carlton great Syd Jackson's games record for Carlton by an indigenous Blue. In celebration, he slotted 8 goals! % 138.6 130.9 138.2 132.7 128.6 132.5 . . . . . Contributors to this page: WillowBlue , molsey , PatsFitztrick , Jarusa , snakehips and pblue . Page last modified on Thursday 27 of September, 2012 09:03:58 AEST by WillowBlue. Don Rainsford with 3UZ DJs and staff.